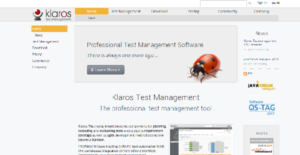 Klaros Testmanagement is a user-friendly web-based project testing tool that enables users to manage the test cases of their projects. Results to corresponding test runs and all other test-related data are submitted and stored to a secure database. In this database, users can define a number of revisions on critical test objects as well as create unique reports. Klaros-Testmanagement offers a resource management section that displays both current and future workloads for individual testers and wherein users can track the progress and rate of success of their tests. At every step of the test, users can provide comments or explanatory screenshots. Extensive reporting system makes it easy for users to generate and share custom reports and documentation with other developers and customers. Klaros Testmanagement grants you total control and coordination over the entire testing process from start to finish. This allows you to handle every phase and facilitate the tasks and progress of your team, resulting in the generation of meaningful and relevant reports and statistics. With you on top of every step, you are able to monitor all the process, closely inspect the quality of the software, fully utilize your staff, and monitor the progress of projects at any given time. Klaros Testmanagement makes it easy for you to create test tasks and assign them to testers based on specific qualifications or criteria. With just a push of a button, you can automatically generate test tasks and send them to your testers for them to accomplish. The software can be easily integrated into your existing workflows and processes, as well as automation tools and continuous integration servers. This capability makes it easy for Klaros Testmanagement to generate and monitor issues and defects and implement test case results. Aside from being able to create and define your own custom fields and reports and use recurring templates for repeat steps and processes, Klaros Testmanagement helps you centralize and modularize your test cases for easy management. If you are considering Klaros Testmanagement it may also be beneficial to analyze other subcategories of Best Test Management Software gathered in our base of SaaS software reviews. Each organization has different wants and needs an application that can be personalized for their size, kind of employees and clients, and the specific industry they are in. For these reasons, no software can offer perfect tools out-of-the-box. When you look for a software app, first be sure what you want it for. Read some Klaros Testmanagement reviews and ask yourself do you need basic tools or do you want sophisticated functionality? Are there any industry-specific tools that you are searching for? Obtain the answers to these queries to aid your search. There are lots of elements that you need to consider and these include your budget, particular business requirements, your organization size, integration needs etc. Take your time, try out a few free trials, and finally zero in on the app that offers all that you need to enhance your organization competence and productivity. How Much Does Klaros Testmanagement Cost? We realize that when you make a decision to buy Test Management Software it’s important not only to see how experts evaluate it in their reviews, but also to find out if the real people and companies that buy it are actually satisfied with the product. That’s why we’ve created our behavior-based Customer Satisfaction Algorithm™ that gathers customer reviews, comments and Klaros Testmanagement reviews across a wide range of social media sites. The data is then presented in an easy to digest form showing how many people had positive and negative experience with Klaros Testmanagement. With that information at hand you should be equipped to make an informed buying decision that you won’t regret. What are Klaros Testmanagement pricing details? What integrations are available for Klaros Testmanagement? If you need more information about Klaros Testmanagement or you simply have a question let us know what you need and we’ll forward your request directly to the vendor.